I don’t know exactly since when I love to eat noodles. I just remember that since I was child my mother often cooked noodles for breakfast. For me, noodles can be considered as my comfort food 😉 When I live in Pontianak, a city steeped in Malay-Chinese culture, I enjoyed many kind of delicious food use Asian noodle, from Bakmi, Fried Kwe tiau, fried egg noodles, and so on. And now when I have been moved to Malang, I also can enjoy with so many variations of Bakmi. As you know, one of famous culinary in Malang is Bakmi. Almost every city in Indonesia has their own style of noodle, if you live in Malang it will called Bakmi Malang, but if you go to Bandung it will called Bakmi Bandung, go to Medan and it will called Bakmi Medan, etc. Yesterday, I read about history of noodle. Actually, the origin of noodles is still debatable until now. Some said that noodles firstly came from Mediterranean region, but others said that it came from Middle East region. Whatever it is, I only know that in majority of Asian countries (Japan, Korea, Indonesia, Thailand, Malaysia, etc), noodles are quickly spread from China. In Chinese culture, noodles is symbol of long life, so it is traditionally served on Chinese New Year as symbol of longevity. There are many types of noodles in Asian cuisine, including in Indonesia. For the first time, I though that make homemade noodles is very troublesome. But the fact, make homemade noodles is a lot simpler than I think. 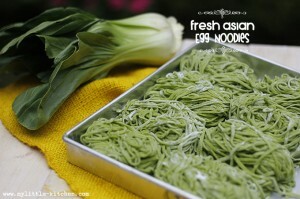 There are 2 step process when making fresh noodles, first: making dough then turning dough into noodles. 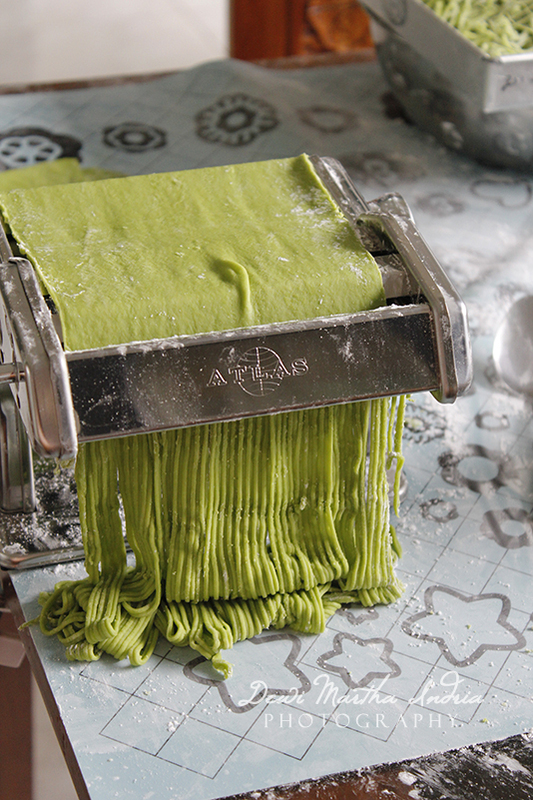 I rely on my pasta/noodle maker by Atlas that I bought just because I want to make fresh homemade noodles, LOL. But don’t worry too much, if you don’t have any pasta maker or machine, you can use simple tools, just a rolling pin and a cutter 😉 For me, having pasta/noodle maker is a kind of good investment for your kitchen, we can make fresh noodles and Italian pasta at home. I got the recipe from my friend, Hesti in here. The real recipe only use 50 ml of water, but in this recipe I modified a bit the amount of water. 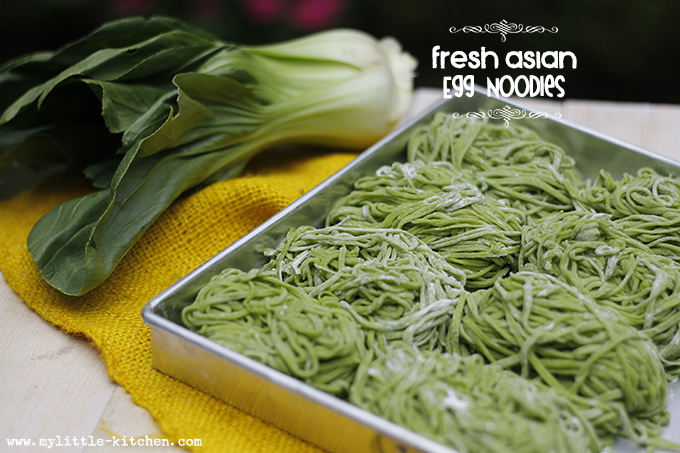 Maybe if you want to search some others noodle recipe, you will find the majority of noodle recipe using highly alkaline lye water, although the recipe’s title is Chinese/Asian egg noodles actually the recipe don’t use eggs. But I tried not too add any kind of chemical in my noodles, no preservatives and no chemical colourings. I use Chinese cabbage to give green colour to the noodle, but you can freely substitute it with any kind of vegetables such as spinach for green noodles, carrot for orange noodles, beet for red noodles, etc. So, here it’s the recipe…. Blend Chinese cabbage with water using a blender. Strain using strainer, we only use the green water. 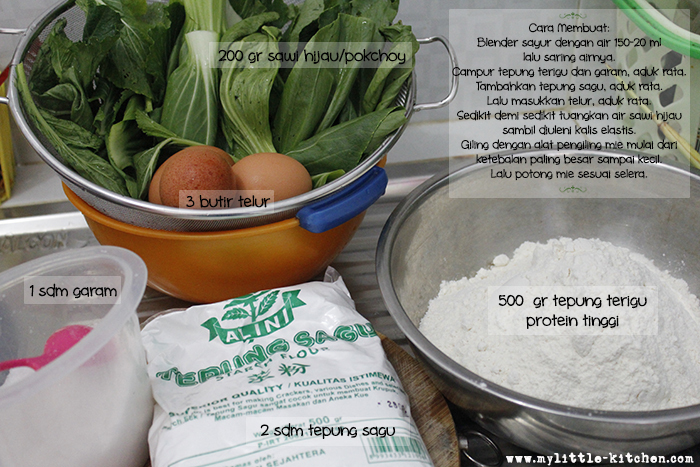 Pour high protein flour and salt in a bowl, mix well. Add tapioca flour, mix well. Add eggs and You can mix those by hand or machine. Pour the Chinese cabbage's water. Knead the dough for 5 minutes. We need soft enough dough to roll out. Softer dough has more water and may need more flour to bring the dough back into balance. Kneading the dough should not take more than 5 minutes. After the dough is well mixed, let it rest When the dough is well mixed, let it rest. Use cling wrap or kitchen cloth to cover the dough. 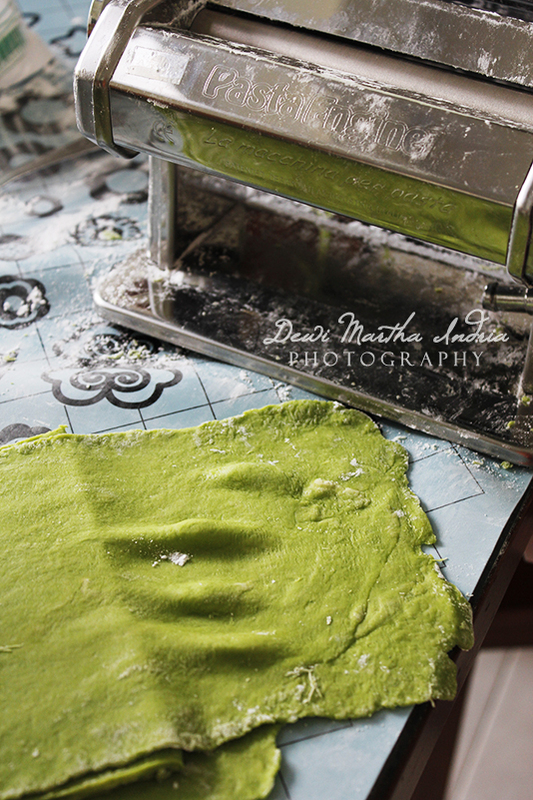 While resting the dough, prepare the pasta/noodle maker or rolling pin and cutter if you use hand. Roll the dough out into a long shape to fit into the pasta machine. Dust with the tapioca flour to keep the dough from sticking. On the pasta maker, turn the knob to 1 for the first roll. Fold the dough back on itself and put the dough through the pasta machine again. Repeat the process a few times until the sheet looks smooth. Sprinkle some tapioca flour on the sheet before each roll. Crank up the knob to larger numbers and roll out the sheet until you get to number 6 or 7. at numbers 6 or 7, the noodles are just the right size to make the small strand Asian egg noodles. Attach the noodle cutter to the pasta maker. Use a small strand cutter for egg noodles. Toss and separate the cut noodles while sprinkling some tapioca flour on them. Divide the dough into half. Roll each one separately. Sprinkle tapioca flour to prevent noodles from sticking. When you get the desired thickness, between ⅛ – 1/10 of an inch, roll the sheet up like a roll of gift wrapping paper. Slice the the roll into ⅛ of an inch wide cuts. Toss and separate the cut noodles while sprinkling some tapioca flour on them. suka banget hasil fotonya kak, kereen.. (salah fokus..hehe)..